Gov. Jerry Brown Friday announced appointment of Rincon Fire Department Chief Edward Hadfield to the State 9-1-1 Advisory Board. Hadfield has held his post with the Rincon Fire Department since 2015. 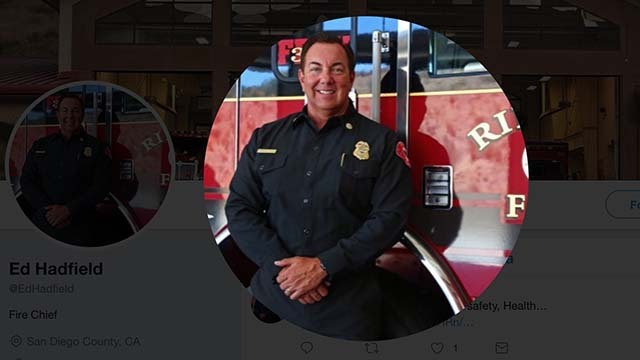 Between 2013 and 2015, he served in several capacities with the Santa Maria Fire Department, including as chief officer, fire marshal and operations chief. Hadfield worked for the Coronado Fire Department from 2007 to 2013, including as chief officer, fire marshal and training chief, and was also previously employed by the Vista Fire Department and Rancho Santa Fe Fire Protection District, among other fire agencies. Hadfield serves as Area 4 South director for the California Fire Chiefs Association Board of Directors, director-at-large of the International Association of Fire Chiefs Board of Directors and chairman of the California Department of Forestry and Fire Protection Native American Advisory Council, in addition to other boards and associations. Hadfield holds a master of science degree in organizational leadership from California Coast University. His position does not require Senate confirmation and there is no compensation.